Another problem I have with Why Nations Fail and public choice theory is that it if anything understates the amount of horror one is likely to get out of a public choice dystopia. One can account for a great deal of the cruelty and terror inflicted by extractive dictatorships by a rational agent hypothesis--in Syria right now, for instance, Assad is murdering his own people by the score for fairly obvious self-interested reasons. His position is threatened by an uprising and he intends to bludgeon protesters into submission because that's the the only way to hang on to power. The next question, of course, is whether the repression itself is only fueling the uprising, but these sorts of things take on a life of their own quickly; once you've started, it's easy to get caught in a ratcheting cycle of violence. But pure, rational self-interestedness doesn't quite capture the full behavior of unaccountable elites. They are also often cruel, for no reason at all. 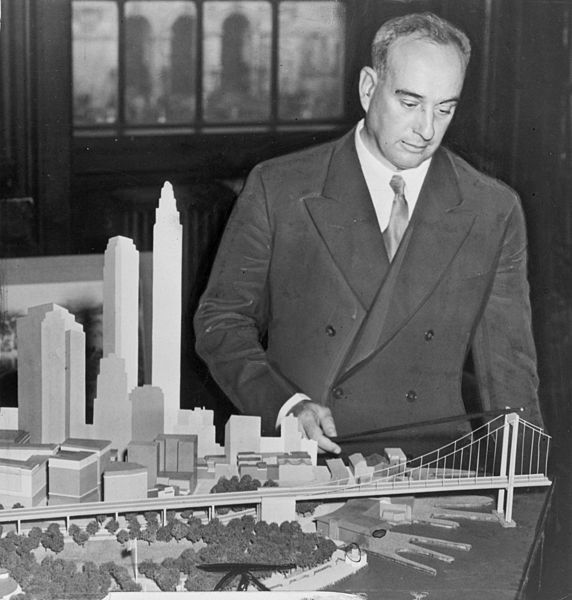 History is full of vicious, murdering lunatics in positions of power, but my favorite example is one from the life of Robert Moses, the great power-mad master planner of New York City. Not because it's especially violent or bloodstained, but because it's so utterly senseless. Late in his career Moses was ramming highways through New York with reckless abandon, and probably the worst one was the Cross-Bronx Expressway. The key detail in this story--told of course by Robert Caro--is that one mile of the highway, as planned by Moses, passed just north of an open space in the East Tremont neighborhood, an existing street and park. But in 1953 Epstein was standing in Moses’ way, telling Mayor Wagner that there was no rational reason for Moses to shove the Cross-Bronx Expressway through the East Tremont neighborhood of the Bronx on a route that, in just one mile, would require the demolition of fifty-four separate apartment houses when there was another, parallel route, which would require the demolition of exactly six small brownstone tenements, just two blocks away. There was no engineering or money or even power-based explanation for why Moses paved over the houses instead of avoiding them. In fact it would have been cheaper and easier for everyone, including Moses. Caro considers several reasons for why Moses would do such a thing, and in the end we can't know for sure, but we can know is that it had nothing to do with rationality. Power makes people not just utterly self-interested, but also crazy and mean-spirited. I know, I have seen, the desperation and disorder of the powerless: how it twists the lives of children on the streets of Jakarta or Nairobi in much the same way as it does the lives of children on Chicago’s South Side, how narrow the path is for them between humiliation and untrammeled fury, how easily they slip into violence and despair. I know that the response of the powerful to this disorder -- alternating as it does between a dull complacency and, when the disorder spills out of its proscribed confines, a steady, unthinking application of force, of longer prison sentences and more sophisticated military hardware -- is inadequate to the task. They were written by Barack Obama, a man who is right now steadily applying longer prison sentences and more sophisticated military hardware to America's disorder problems. He believes he can assassinate American citizens at will. You could argue that Obama was simply lying when he wrote that (c. 2004, I believe), but at the risk of sounding naive I really believe he meant it, and the lesson here is no one can be trusted. Instead we must make sure our institutions are functioning properly. Public Choice in fact would predict that rulers act willfully awful when they're insufficiently incentivized to please the citizenry in general; they choose rather their own inner circle. Bruce Bueno de Mesquita is a good read on the above point. Well yeah, that's basically the conclusion of yesterday's post. I don't think the dry language of game theory really captures this process, I think that the kind of people who end up in power in every country are almost always fundamentally twisted on a moral level, want more power above all else, and will do almost anything to get it. "Incentives" in this case includes things like public disgrace and prison. This really doesn't bear much on my point here though, which is that unrestrained rulers are often cruel for no reason at all. They're not self-dealing, or giving their brother a contract, or whatever, they're just being cruel for its own sake.